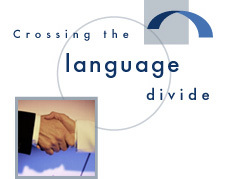 With our extensive linguistic, technical, and business expertise, Executive Translations is the ideal language solutions provider for international corporations, management consulting firms, and high-tech companies. As a result of our commitment to maintaining long-term client relationships, our clients are accustomed to receiving professional, individualized service. By building partnerships with our clients, we are able to anticipate and meet their needs with utmost efficiency. Our detailed knowledge of our clients' corporate culture, style, and terminology allows us to ensure consistently accurate, client-specific results.